The world has lost a wonderful woman. Hubby’s grandma passed away last Sunday. She will be dearly missed by many including me. My blog page will be hers for the weekend as we get together with family and friends to celebrate her life. Rest in peace Grandma Marie, we all know you are watching over us. Marie Sylvia Heuer, age 104, of Port Edwards, WI, formerly of Wild Rose, WI, passed quietly on September 2, 2012. Marie was born June 14, 1908 in Wautoma Township, Wisconsin, to Henry Olaus Thompson and Maud C. (Selsing) Thompson, the fifth of seven children. On May 14, 1930, she married Edwin H. Heuer in Waushara County, Wisconsin. She worked as a one-room schoolhouse teacher before assisting Edwin in the family meat market business in Wild Rose, Wisconsin. She served as ward clerk at the Wild Rose Community Hospital from 1954-1979, and continued to work there part-time for several years after that. She was an active member of the Wild Rose United Methodist Church ladies circle. 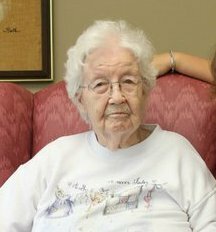 She is survived by her three children – Edwin (Mary) Heuer, Marilyn (Thomas) Sanford, and Wendy Caswell – in addition to 11 grandchildren, 24 great-grandchildren, and 8 great-great grandchildren. Marie was predeceased by her husband, Edwin Heuer in 1994, six siblings, her son-in-law James Caswell, and one great-grandchild. Special heartfelt thanks to the staff of Edgewater Haven for their loving care of Marie during the last few years of her life. I’m so sorry for your loss. I like the dessert line. My mom had a friend who’s mother would say the same thing. I’m sorry for your loss. She sounds like a wonderful woman. It sounds like she led a long and interesting life. I love her motto about dessert. Oh Lori- I am so sorry to hear of your families loss. My thoughts and prayers will be with you and your family. While you eat dessert first, think of all the wonderful memories you have of her. So sorry for your loss, but she sounds like a wonderful and humorous person. Loved her saying about eating dessert first. Now, to honor her, you can add that to your practices! I am sorry for your loss she sounds like a really awesome woman. She reminds me of my mother who I lost 2 years ago she also loved her dessert first especially her ice cream lol. My prayers are with you and your family. Sounds like she had a very full life. I’m so sorry for your loss. She sounds like a wonderful person. Sorry for your loss. She sounds like an amazing person. I think I will adopt her dessert line. I lovei t! Sorry for your loss. She sounds like a wonderful lady and it looks like she lived a long life with many whom loved her. My deepest sympathies to you, Jeff and your family. What a beautiful tribute. May your memories of happy days bring comfort to you. I am sorry for your loss, my sympathies to your family. My prayers are with you and your family. Sounds like a lovely woman who led a good, long and beautiful life. My thoughts and prayers are with you and your hubs. What a blessing to have known such a lovely soul. Lori, sorry to hear of yours and your husband’s loss! It sounds like Grandma Marie was an awesome person, and that she lived a full life! I love her favorite thought! Thank you so much everyone. She will live on in my heart but I will miss her calming nature and that smile.